EMA made an urgent yet straightforward plea to citizens prior to the Midterms: VOTE FOR OUR PLANET. Our environment is always on the ballot, which is why we thought it was important to remind people to consider it when choosing their candidates. To get the word out, we partnered with League of Conservation Voters and Rise Up Network to create a viral video for social media (watch it above). A big thanks to EMA Board Members Asher Levin and John Quigley for creating the videos and to Board Members Malin Akerman, Lance Bass, Ed Begley Jr., Wendie Malick, Scottie Thompson, Constance Zimmer, and EMA CEO Debbie Levin for lending their voices. 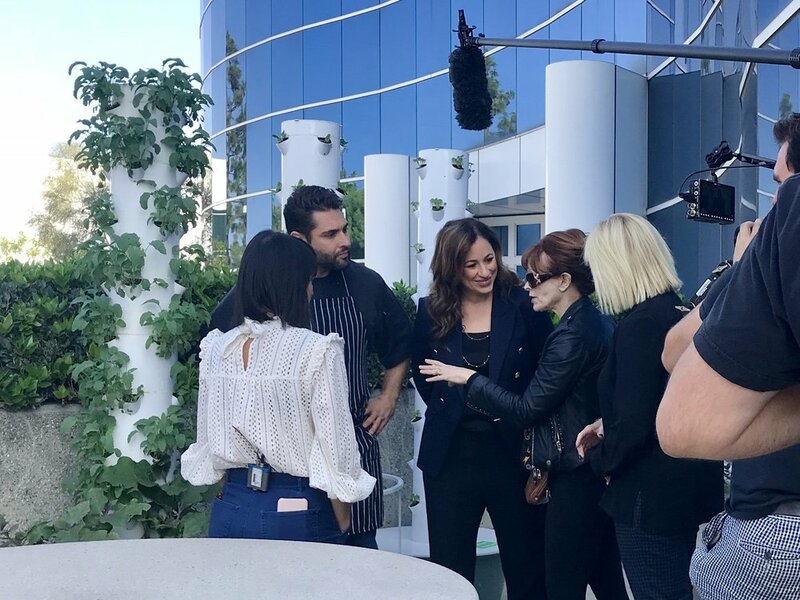 Earlier this month, the EMA team, along with longtime Board Members Frances Fisher and Constance Zimmer, took a field trip to the ECOS facility in Cypress, CA. Family owned and operated since 1967, ECOS has been a pioneer in manufacturing environmentally friendly cleaning products. ECOS is also a longtime partner of EMA. With over 50 years of breaking barriers in green science, ECOS has created over 200 cleaners that are safer for people, pets, and the planet. On top of that, ECOS creates all its products at a zero-waste certified facility powered by renewable energy. In other words, ECOS is an excellent example of the potential of a green economy; a business with sustainable practices that benefit its employees, bottom line, and customers. We were greeted with open arms by Kelly Vlahakis-Hanks - President and CEO, and her incredible team. Awash with its trademark blue and impeccably clean floors, the facility was loud and proud of its Earth and Health First approach to business. Highlights included water refilling stations, vertical gardens used for employee lunches, electric Toyota forklifts, and giant murals of art made from recycled plastics. Kelly Vlahakis-Hanks, ECOS President and CEO shows the vertical gardens. ECOS is the only company in their sector to achieve the "trifecta" of sustainable manufacturing: carbon neutrality, water neutrality, and Platinum-level Zero Waste certification. They even offer incentives for employees to install solar, live closer to work, and drive hybrid vehicles. How cool is that? During our tour, we learned that ECOS products are free of dyes, parabens, phosphates, phthalates, pearlizers or optical brighteners, and are never tested on animals. In other words, these plant-powered cleaners are safer for our families. It's so important to get the word out to consumers that just because a product is on the shelf doesn't mean it's safe. By putting a spotlight on companies such as ECOS, EMA can educate and encourage families to make healthy, sustainable choices when they shop. We want to extend our gratitude to our friends at ECOS for the inspiring field trip! Stay tuned for our video. You may be well acquainted with Barry's Bootcamp as the place you go to get the best workout in the world and meet your fitness goals. Well, now there's a goal Barry's is working hard to reach: becoming the first to receive our EMA Green Seal for Fitness Company. With 50 studios globally, this ambitious project will send a message that your workout routine should be healthy for you AND our planet. Barry's announced their green plans at their Decades Festival celebrating twenty years in business. Further, Barry's generously donated proceeds from its ticket sales to support EMA's ongoing programs. We are thrilled to move forward with this great new relationship! The evening featured food made from locally-sourced ingredients, water refill stations, JUST water bottles, and biodegradable plates and utensils. We are so excited to partner with Barry's Bootcamp as they lead their industry towards a sustainable and healthy future. We all know that sunscreen is a vital part of keeping your skin healthy and protected, but did you know that the type you use is equally important? Recently, the state of Hawaii passed a bill banning the sale of sunscreens containing two chemical sunscreen agents: oxybenzone and octinoxate.Both were found to contribute to coral bleaching, having a detrimental effect on the coral population and the ocean’s ecosystem as a whole. While the ban still needs to be signed off by the governor and won’t formally go into effect until January 1, 2021, it sends up another major red flag that we need to get serious about the ingredients we use in our personal care. Why Are Some Sunscreens Bad for Coral Reefs? Thankfully, our skin can still get the sun protection it needs while keeping our ocean friends safe. It starts with minerals, but even then, you still need to use the right kind. Be wary of mineral sunscreen that doesn’t look opaque right out of the tube, it may contain zinc or titanium dioxide nanoparticles.These micro-sized minerals go on clearer than their heftier-sized counterparts, but they aren’t so good for the ocean. Because of their tiny particle size, they are able to interact with the cells of phytoplankton and stunt their growth. Both the coral reef and phytoplankton are important in sustaining a healthy ecosystem for marine life. Looking for a reef safe sunscreen? Check out Squalane + Mineral SPF 45 from EMA Partner Biossance. It contains non-nano zinc and titanium dioxide, making it safe for the sea while keeping our ocean friends (and our skin) healthy and happy. In fact, it made the EWG 2018 Guide to Sunscreens. To be represented in the guide, a sunscreen must be proven effective and safe for people and the environment. Staying on the theme of sustainable products that are better for our planet and health, we'd like to announce the launch of dame sustainable clothing! The brainchild of EMA Board Members Alexx Monkarsh and Molly Levin, dame sells elevated yet wearable sustainable fashion. Inspired by the strong women in their lives, Alexx and Molly have set high standards for the clothes they sell. From the dame website, "Keeping with our sustainable mission. We use a majority of deadstock: the residual fabrics left over from major fashion houses. Instead of ending up in a landfill, these fabrics are repurposed for our collection." Dame launched its sustainable fashion line with a party hosted by EMA Board member, Malin Akerman and attended by many Board Members and friends including, Katie Aselton, Frances Fisher, Amy Smart & Carter Oosterhouse, Maya Rudolph and Constance Zimmer. We want to thank all of our supporters for making 2018 one of our most productive and successful years to date. The work is far from done. We'll need to be even louder next year, so please consider renewing your tax-deductible support for EMA with a donation. Holiday shopping on Amazon? Make sure you set your Amazon Smile account to support EMA. Click the link below to shop for EMA. Each Sunday, the EMA community shares an optimistic story on social media. From a new plastic ban to a conservation win, these stories are meant to give people hope among a news cycle that's too often doom and gloom. Click the images below to share!